A Pakistani computer expert with alleged al-Qaeda links appears to have provided information leading to a string of arrests in his own country and the United Kingdom. Mohammad Naeem Noor Khan was detained in the Pakistani city of Lahore on 12 July. Pakistani authorities give varying accounts of his alleged role, but certain officials say Mr Khan is a key piece in the al-Qaeda jigsaw. It was from his computer, they say, that intelligence officials were able to follow an e-mail trail leading directly to a Tanzanian wanted for the 1998 US embassy bombings in East Africa. 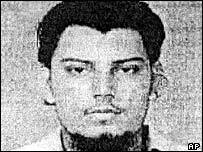 The officials say the 25-year-old Mr Khan acted as a link between top al-Qaeda leaders and operational cells. Some reports even say details for an attack on Heathrow airport and other London buildings were found on his computer - but Islamabad is not confirming this, even in background briefings. What is known about Mr Khan is that he is a former student at a UK university. He began taking classes in human resource management at City University in central London in January 2003. Aftern attending four of 10 lectures, Mr Khan then disappeared. The BBC's Newsnight television programme has learnt that a number of terror suspects arrested in England this week were held because of alleged contacts with Mr Khan. Mohammad Naeem Noor Khan is one of a number of al-Qaeda suspects arrested in Pakistan since early June. Information on Mr Khan's CDs and computers is believed to have led to a raised terror alert in the US. He comes from a middle-class neighbourhood in the southern Pakistani city of Karachi, and graduated from the city's prestigious Nadir Eduljee Dinshaw Engineering University in 2001. Zafar Qasim, one of his former teachers there, remembers him as a quiet gifted student who kept out of trouble. "He was a little religious and had a short beard... but I never saw him engage in the activity of any student organisation," Mr Qasim told the Associated Press. Mr Khan's father told the same news agency he had not seen his son for several years.